Where did cocktails emerge from? To find out, David Wondrich takes us back to the proto-cocktail - punch. Distilled spirits became available for public consumption near the end of the 14th century, having previously been restricted to the domain of alchemists, apothecaries, and monks. However, early distilled spirits were often of poor quality - distillation techniques had not been refined, which meant that significant quantities of volatile chemicals like methanol and acetone, as well as heavier fusil oils remained in the final products. These spirits were rather harsh to drink on their own - remaining primarily a method for getting drunk, fast, and producing an absolutely atrocious hangover the next morning. While there were often tinctures made by soaking herbs and spices in spirits, as the higher proof allowed for greater extraction than fermented wine or beer, these were primarily seen as medical products, not a tipple to enjoy of an evening. However, a new use was found for spirits due the burgeoning international trade beginning to flow into Europe at the end of the 17th century. Most importantly, trade with with Asia was expanding - the Dutch East India Company (VOC) was in its heyday and the British East India Company was growing as well. This meant that exotic spices and fruits were becoming more common in Europe, especially in the hands of the upper classes. This set the stage for the creation of punch. Wondrich takes the reader through the pre-history of punch, then goes on to describe how it evolved over the centuries, trickling down to be the drink of more common men as well as the upper classes. Read about how much punch George Washington budgeted for serving to constituents while running for the Virginia House of Burgesses or how the coffee house culture of Enlightenment London was turned on to punch, sparking drunken discussions (and brawls) between some of the most notable men of the day. 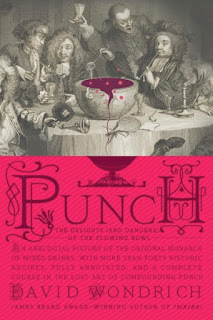 Punch was ascendent for almost two centuries until it was overtaken in the 19th century by the American innovation of the cocktail - a small, personal, bracing punch that could be drunk quickly instead of sitting with ones compatriots around the flowing bowl. Throughout the book, there are recipes in their original state, which are also translated into more comprehensible modern measurements. Punch-making details are provided, such as how to make a proper oleo-saccrum (extracting citrus oils into sugar). This is a fantastic read, making a rather esoteric subject entertaining and enthralling. I highly recommend this book, especially for those of a booze nerd-y disposition. Build over ice. Stir to combine and dust a little nutmeg on top. The sip begins with mild sweetness, which carries through in balance with the lime. The funky notes of arrack and rum are smoothed out a bit by the cognac, while the soda water provides a bit of snap. Over time, the nutmeg filters into the drink. 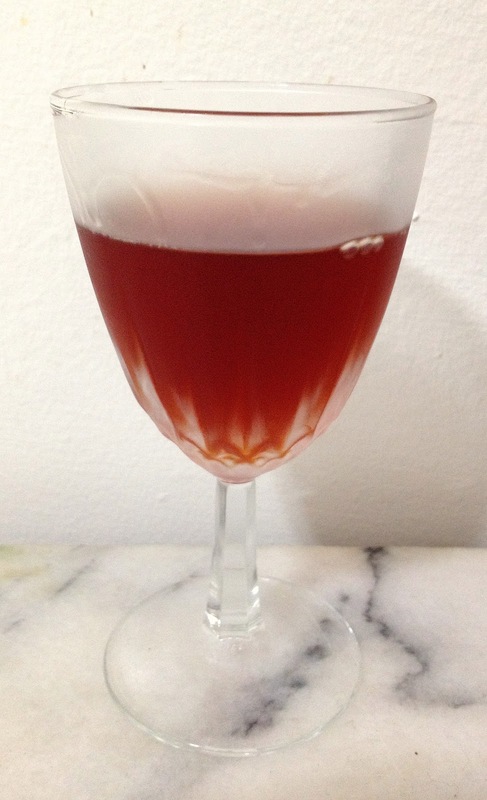 This is possibly the ur-punch, being composed of ingredients that would have been available to members of the British East India Company stationed at their fortress in Bombay. The original version was made exclusively with Batavia arrack along with nutmeg from the Dutch East Indies, as well as locally-souced limes and palm sugar. However, splitting the base spirit with strong Jamaican rum and mellow cognac gives it even more depth. The soda water isn't really in keeping with the original (soda water wasn't invented until the late 18th century), but I find it adds a nice something to the drink that you won't get with less fizzy water. This punch is quite a crowd-pleaser - I've served it to people ranging from members of my lab to my own family and friends, always with great results. First off, thanks to my reader Florin for a sample of this whisky. 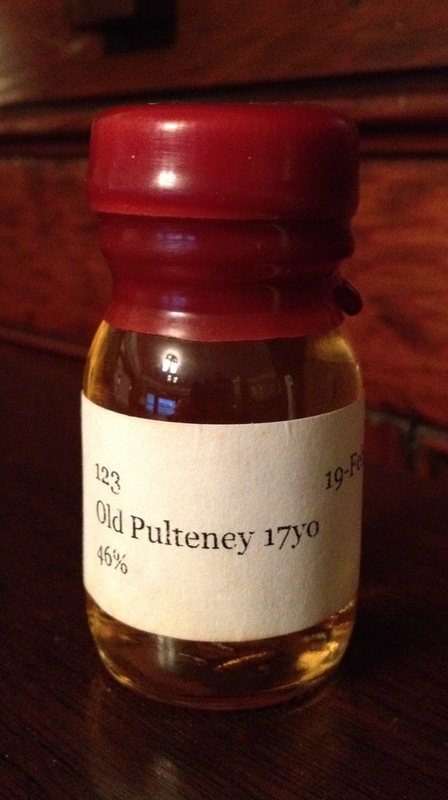 I was quite intrigued by Old Pulteney, especially after their 21 year old was declared 'Best Whisky in the World' by Jim Murray at the end of 2011. Now, I'm not one to ascribe too much weight to awards, but that's some pretty high praise. However, I also heard some pretty good things about their 17 year old expression as well. 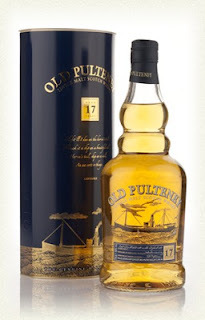 Old Pulteney has a history stretching back to 1826 when the distillery was founded on the extreme northeast corner of Scotland (Old Pulteney is the northernmost whisky distillery on the mainland) in the town of Wick. The location is not so peculiar when you consider that the distillery was built at a time when it was far cheaper to ship supplies by water, as good roads did not reach many of the distant parts of Scotland, making it much less remote than it would seem at first glace. The town was also a major center for herring fishing until the mid-20th century, until stocks precipitously declined. The distillery has two very peculiar stills - one where the lyne arm appears to have been chopped off and another with a strangely twisted lyne arm. Additionally, Old Pulteney is one of the few distilleries to still use copper worm-tubs instead of more modern condensers. The distillery passed through a number of different owners before landing in the hands of Inver House in 1995. Nose: pleasantly sweet malt with a sour edge, light vanilla, caramel creme, citrus, toffee, salted chocolates. After adding a few drops of water, the nose becomes creamier, the sourness disappears, and more chocolate emerges. Taste: sweet/sour up front, then malt, wood smoke, and mildly bitter oak tannins, with cacao throughout and some sherry buried under the malt. After dilution, it becomes less sour, but the remaining sourness carries through the palate, there are pepper and floral notes added on top of the wood and chocolate. This was a very nice, sweet whisky. However, I can't say that I found it to be more than that. I kept looking for more depth, but couldn't quite find it. It reminds me a lot of one of its northern cousins, Glenmorangie Original. The salty maritime notes were a nice addition to that template, but not enough to push it into a higher plane. I was a little bit surprised by the lack of sherry influence, particularly its absence on the nose. The 17 year old is a mixture of whiskies from ex-bourbon and ex-sherry casks, with the sherry casks mostly coming from PX and oloroso sherries. However, there is a significantly greater proportion of bourbon cask whisky in the mix, so the sherry cask whisky may just be too minor of a component to really shine. I will give the distillery some points for bottling this whisky at 46%, especially seeing as the it's also very smooth for its bottling strength, which makes it an easy sipper. At this point I need to try the 12 year old version, which is usually priced fairly competitively, to see if the 17 year old is worth the extra cash. This drink comes from the Denver Hilton, circa 1960, via Beachbum Berry Remixed. Combine all ingredients, shake with ice, then pour unstrained into a chilled rocks glass with more crushed ice. The nose is dominated by the falernum's spice notes. The sip opens with sharp citrus acidity and vanilla from the rum, which segues into the ginger spice of the falernum, inflected by dark fruit from the Heering. This drinks verges towards the dreaded 'muddled flavor profile' that late-stage tiki drinks often fell prey to. However, there is a distinct evolution of flavors, which keeps it from falling apart. I would suggest using falernum syrup in this one rather than falernum liqueur, because the stronger ginger note from the alcoholic version tends to overwhelm the other components. Continuing my rhum agricole kick, this is the first of two reviews I'm going to be doing of aged rhums from the Saint James distillery on the French island of Martinique. Nose: oak, sweet berries, vanilla, slightly floral, strong grassy/cane note, somewhat harsh musty funk notes. After adding a few drops of water, the nose becomes a bit flatter, and while the grassy notes dominate at first, it eventually reveals creamy berries and very strong floral perfume notes. Taste: dry cane up front, which becomes a bit sweeter and creamier mid-palate, a huge blast of pepper, a bit of oak and dry cacao near the back, which all smoothes out with time. After dilution, it becomes thinner, but sweeter and creamier, with lighter pepper and the addition of nutmeg and more cacao. Finish: oak, vegetal, residual pepper heat, slightly bitter. After dilution it becomes raspberries, pepper, nutmeg, dry cacao/coffee. This was the first rhum agricole I ever bought, largely because it was the only one available in Oregon at the time. My first taste was... not good... as the strong and somewhat harsh flavors were just too much for me to handle. So it got relegated to the back of my liquor stash. I've slowly worked through the bottle, with an experiment here and there, but now that I have a better appreciation for rhums, I've returned to find it a rather tasty dram. Saint James Royal Ambré holds a position between the lightly aged Élevé Sous Bois and Paille rhums from various distilleries, which tend to be aged for about twelve months, and the VSOP and Vieux rhums, which tend to be aged for four to five years. Royal Ambré is aged for eighteen to twenty-four months, which is long enough to add quite a bit of oak-derived flavors while leaving the grassy, funky vegetal flavors of raw cane undimmed. The rhum is bottled at a very reasonable 45%, which gives it heft without making it quite as strong and ethereal as its 50% ABV brethren. Most notably, Royal Ambré is the only AOC rhum agricole I've seen in the States going for under $25 for a 750 mL bottle, which makes it an exceptionally good value. The closest I can find in the same range would be La Favorite Ambre, but it's a bit more expensive, younger, and requires committing to an entire liter bottle. If you're looking for a rhum, especially for making tiki drinks, Saint James is a pretty easy choice. Combine all ingredients, shake with ice, then pour unstrained into a double rocks glass. Fill with crushed ice and add a sprig of mint for garnish. 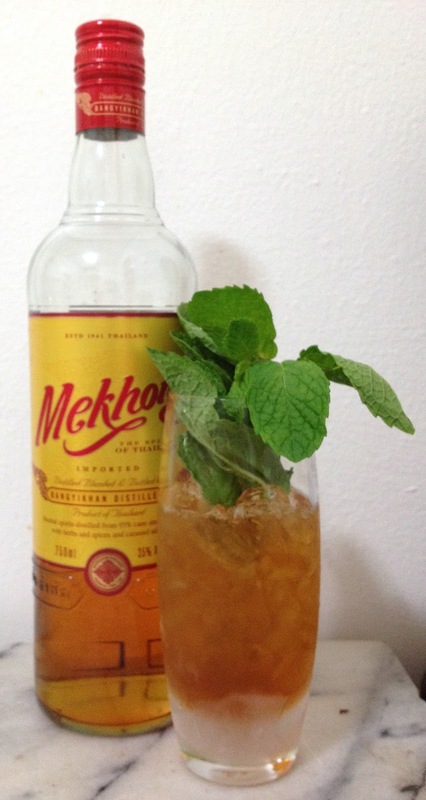 The mint garnish dominates the nose, though some funk from the Jamaican rum also makes itself known. The sip begins with moderate orgeat and orange liqueur sweetness. But soon enough its time for the funk, with the Jamaican rum and rhum agricole tag teaming your taste buds. With time, the mint begins to infuse the drink, coming in around mid-palate, adding its herbal notes to the funky r(h)um esters. This mai tai is a kick in the face - but in a good way. It is almost exactly the mai tai you'll get from Blair Reynolds' new tiki bar, Hale Pele. I tried one back on opening night and found it brash but delicious. While Smith & Cross is likely to be more attention-grabbing, the Saint James rhum is almost as important. I feel like it's the only rhum that's bold enough to stand up to all that unadulterated Jamaican funk. However, adding a little bit of extra orgeat seems to be important to both mellow and integrate the rough 'n ready flavors of r(h)ums, transforming them into something absolutely exquisite. This is stiff competition for the best mai tai I've ever had. Inspired by Michael Kravitz's most recent post about tasting an old Rosebank, I decided that it was high time to find out what all the hype was about. Stuart Ramsey declared it to be one the distilleries that he misses the most during his talk at Cocktail Camp. So I took a trip down to the Highland Stillhouse, which has an amazing selection of hard- to impossible-to-find whiskies. Nose: gobs of fruit and floral notes - almost perfumed, estery, unripe bananas, sour malt, a bit of vanilla, grape juice, a dusting of cocoa powder. After adding a few drops of water, the nose becomes sweeter, with the floral notes dominating the fruit, and more vanilla, which integrates with the malty notes. Taste: sour malt - becoming sweeter with time, creamy, light grape juice, then pepper and bitter oak near the back. 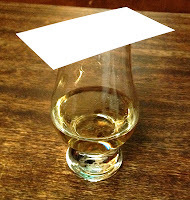 After dilution, the palate becomes much richer and more integrated, with lots of vanilla-tinged malt, and more pepper. This is an interesting whisky. I found it a bit disappointing at first, as there wasn't a lot of complexity. It also sounds like it might not be the most exemplary offering from the distillery. However, this does have the distinction of being the only whisky I've ever had that was bottled at 40% and got better after adding water. The little bit of dilution really improved the body of the whisky and transformed it into an engaging sort of simplicity. I have a feeling that this probably came from a relatively inactive refill cask, which would explain the almost invisible cask influence. Instead, it seems to be almost all about the malt, mellowed only a little bit by time and oak. While nearly impossible to find now, this probably would have been a $35-40 whisky when it was originally released, which sounds like an amazing deal in this day and age. I can imagine this being a great whisky to sip on a warm spring day, with breezes blowing the smells of growing vegetation drifting. Sadly, I didn't get to try the sherry cask Rosebank that was on the Stillhouse's list, as it appears to have been finished off. Hopefully I'll find another some day, but this was an interesting experience - add me to the list of people who wish that Diageo hadn't demolished the distillery. It's time for another Mixology Monday! This month's event is hosted by Joseph Tkach over at Measure & Stir. The theme is Garnish Grandiloquence - my one weakness. If you haven't noticed, I don't tend to go in for garnishes very often, despite my love of tiki. Especially because 9/10 I'm making drinks for myself, I care much more about how the drink tastes than how its presented. But for once, I'll make the effort to throw in a little flair. 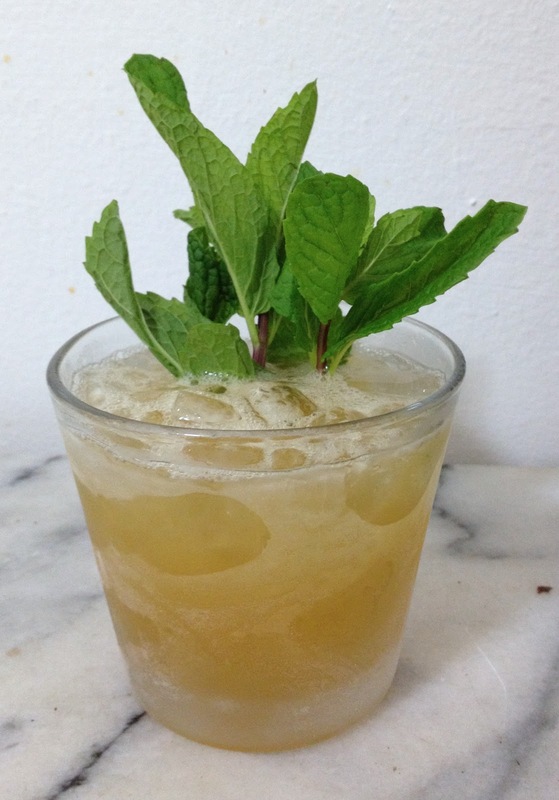 Build over ice, swizzle until the glass frosts, then garnish with several sprigs of mint. The smell of the mint garnish meshed beautifully with the vanilla and spice of the spirits along with some funk from the palm sugar - I could sit and smell this one for a long time. The sip is sweet & sour, with the lime just edging out the syrups, while the falernum's ginger and the bitters team up at the back to give the drink a serious kick. The Mekhong provides a peculiar twist, giving the drink a slightly vegetal edge from the rice component of the spirit. This drink is a small tweak on a recipe from Imbibe, substituting palm sugar for simple syrup and tweaking a couple of proportions to make the drink more spirit-forward. The result is fairly aggressive, but definitely tasty. Thanks again to Joseph for hosting and see you all again next MxMo! Islay is one of the most well-known regions of scotch whisky production. The products of the island are very much 'love it or hate it', so it evinces some strong emotions. Andrew Jefford's book is a chronicle both of the island and the distilleries that have made it famous. He clearly has a love for the island and made numerous trips to learn about the place. Importantly, he doesn't appear to have any particular biases towards or against any of the distilleries, appreciating each equally for what they have to offer. Each chapter is broken up into two parts - first, a section looking at a historical period or feature (weather, terrain, etc.) of the island, then an overview of one of the island's distilleries. The historical sections are very in depth, ranging from geologic (the island is composed of two landmasses that came together via tectonic drift), to the Medieval (the island was the seat of power for a Gaelic-Norse empire encompassing much of the western maritime Scotland), to the modern (the turbulent history of the 19th century). Admittedly I found these sections to be a bit much at times, as Jefford is rather... exhaustive. However, some of it, especially the sections on the 19th century, are useful for understanding the context in which many of the distilleries were created, but I found myself skipping large chunks after a certain point. 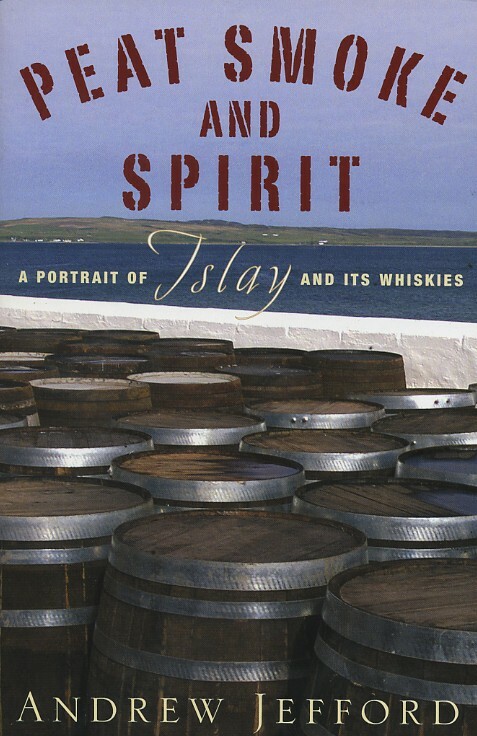 The sections about Islay's distilleries are an absolutely treasure-trove. Each is chock-full of history as well as first-hand experiences at the distilleries. Jefford makes a point of visiting the water sources for each distillery, both to get a sense of how they contribute to the whisky directly and the role they played in the distilleries' histories. There is also a vast amount of detail about the production methods each distillery uses, from the source of their malted barley, what kind of washbacks they use, the length of fermentation, the size, shape, and degree of filling of their stills, the shape and type of condenser attached to each of the stills, how long each distillation run takes and where cuts are made, and the conditions in which their whisky ages. While direct questions to the various master distillers about what makes each spirit unique were often met with negatives (I began to wonder what it was that actually made each distillery's product unique as the list of possibilities was officially whittled down significantly), Jefford does a lot to speculate what might make an impact (still shape and run dynamics seem to come out ahead). If you're ever wanted to know about the details of whisky production, this will provide you all sorts of information. The book is especially interesting as it presents a snapshot of the distilleries in transition. The book was published in 2004, not long after the revival of Ardbeg and Bruichladdich, two of the island's most celebrated brands. Ardbeg had been under its new Glenmorangie/LVMH ownership for about seven years - long enough to start releasing new whiskies from their old stocks (the 17 year old and Uigeadail), but still new enough that their first bottles of 10 year old made from entirely new stocks were still in the future. Bruichladdich had been saved only a few years before the book was published and was still struggling to find its footing, throwing out a wild assortment of cask finished whiskies made from old stocks. Looking ahead, Kilchoman's foundation was still several years off. All of this is useful for someone who wants to understand the state of the scotch whisky industry in the 21st century. 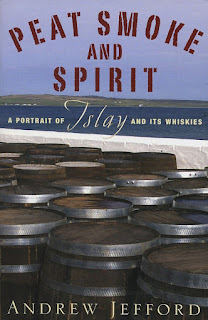 Overall I think this is a very good book to read if you'd like to learn more about the history of Islay and its whisky. It's thorough, well-researched, and evinces a clear love for the place and its whisky. Highly recommended. While at the Great American Distiller's Festival here in Portland, one of the booths that caught my eye was serving up the spread from Bardstown Barrel Selections. While there, Dave Schmier served me everything their range of bourbon and rye whiskeys, which was quite educational. All of their whiskey is sourced from MGP (formerly LDI). However, as I didn't get to spend as much time as I like to with these spirits, my notes are more sketchy. 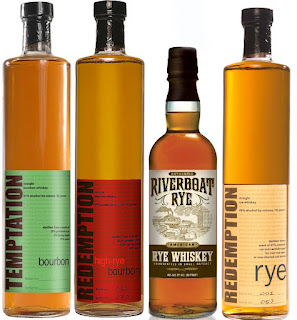 This is the medium rye recipe bourbon of their bunch, with a mash bill of 75% corn, 20% rye, and 5% malted barley. This is a rather young bourbon at only two years old and a fairly low bottling proof of 41%. While a perfectly decent bourbon, nothing about it really stood out to me. While LDI puts out solid juice and there are surprisingly few rough edges on this for being so young, there is also little to recommend it over other bourbons. Worth a try, but I won't be working to buy a bottle. 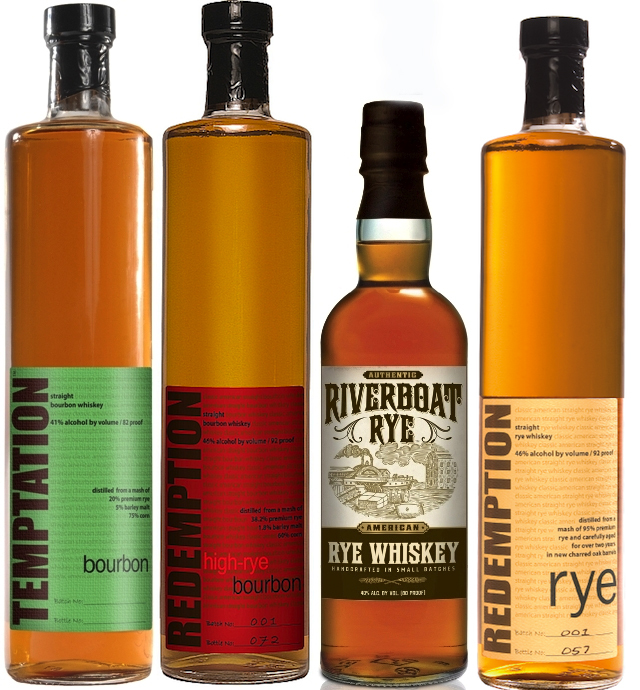 This is the high rye recipe bourbon, with a mash bill of 60% corn, 38% rye, and 2% malted barley. Redemption is the same age as Temptation, at roughly two years. However, it does get bottled at a higher 46%, which helps to give it more oomph. While I enjoyed it more, it's not good enough to recommend it over other high rye whiskeys like Old Grand Dad or Bulleit seeing as they're all around the same price. This is the standard 95% rye/5% malted barley recipe from LDI, but aged for less than four years (if I remember correctly, it's closer to a year for most of the juice) bottled at 40%. This is meant to emulate what rye whiskey was like back in the 18th century, when aging in barrels was usually an incidental side-effect of transport. It is very clearly a young rye, with so much pine that it almost tastes like gin. For me it was more of an interesting experience than something I would want to drink regularly, but it might work better in cocktails. This has the same mash bill as Riverboat Rye, but is aged for at least two years before bottling at 46%. It definitely shows more maturity than its younger sibling, but is still decidedly youthful. Again, not something I would be too keen to sip regularly (Rittenhouse BiB and Sazerac 6 do a much better job), but the higher proof means that it would be an even better choice for making cocktails. As Chuck Cowdery pointed out, whiskeys like these are most likely bottled at a younger age specifically so that they can be balanced out by the other ingredients in cocktails, rather than having the internal balance necessary for sipping whiskeys. What might appear to be a defect from one perspective can be an asset from another. I've reviewed Neisson's younger Élevé Sous Bois expression a few months ago, but I also managed to pick up their older Réserve Spéciale rhum (funny story - I got it for only a hair over $40, rather than the standard $60+, because a liquor store in Washington had it improperly entered into their system as the much cheaper blanc). Neisson is one of the few AOC rhum agricole producers on the French Caribbean island of Martinique. It is one of the newer distilleries on the island of Maritinque, having been founded in 1932 by Jean and Adrien Neisson. Still under family ownership, it remains the smallest distillery on the island, with an output of only 400,000 liters a year (for scale, Glenfiddich distills roughly 10 million liters of scotch whisky every year). Their rhum is produced from sugarcane grown on their own 40 hectares of land, with all of the cane cut by hand. Juice is extracted mechanically from the cane, then fermented for 72 hours before distillation. The wash is distilled in column stills to ~70% ABV as required by the AOC. I've gotten conflicting reports of the age of the rhums that are blended together to form the Réserve Spéciale expression. One source has it composed from rhums aged up to ten years. The distiller's website has the age listed as between 50 and 60 months, with an average of 53 months. I'm more inclined to believe the latter, as rhums seem to soak up oak tannins fairly quickly, but this rhum is pleasantly matured rather than over-oaked. The rhum spends its first six months in 350 liter (not quite double the size of a standard 200 liter bourbon barrel or a bit bigger than a standard 300 liter wine barrique) Limousin oak casks, in the manner of French brandy. After that it is transferred to other oak casks that are no larger than 650 liters (port pipe size). That the rhum spends most of its life in fairly sizable oak containers goes a long way towards explaining the relatively low levels of oak tannins - Neisson seems to be aiming for more oxidation than wood extraction for its rhum. The rhum is finally bottled at 42%, which Neisson suggests is due to a combination of a large angel's share and 'annual topping'. This may mean that they fill up the barrels with understrength rhum or by adding water as the rhum ages. Neither their own web page (they could really stand to hire some better translators) or Google Translate is much help on that front. Nose: plum pudding, red berries, blackberry jam, rich vanilla pastries, dusty oak, a little raw alcohol. After dilution, the nose shifts towards the jammy notes, with more vanilla and emerging floral notes. Taste: barely sweet up front, a big wash of pepper, strong dry brandy flavors, fruity esters that become bitter going into the finish. After dilution, it becomes flatter overall with some sourness up front, grassy notes emerge along with cacao, which become sweeter over time. Finish: brandy, pepper, dark berries, and a hint of oak. I was genuinely surprised by just how much I liked this rhum. Much like the La Favorite Vieux that I reviewed last week, I initially wrote it off as over-oaked. However, now that my palate is a bit more developed, I can recognize it for the berry-fest it is. This rhum has the sweetest nose I've ever encountered outside of a Speyside sherry bomb. It's pure dessert and you're missing out on at least half the fun if you drink this spirit without spending time just smelling it. The taste is a dry in a somewhat disconcerting fashion after the nose, but this isn't particularly surprising - you can't actually smell sweetness, it's all a matter of your brain associating certain smells with sweetness and filling in what it expects to be there. So overall it makes for a very interesting contrast. Once again, I think this is a great pick for someone who enjoys scotch whisky, especially of the sherried variety, to broaden their horizons. The nose will be very friendly and recognizable. The flavors will be a bit more challenging, but worth trying to wrap your head around. In terms of value, Réserve Spéciale is a bit trickier. It usually runs $60-70 for a liter, which is comparable in price to Clément VSOP, but more expensive than La Favorite Vieux and cheaper than Rhum J.M. VSOP. If you can find it for under $60, I'd say it's worth jumping on. Over that and I think you'll want to give it a try before committing to a whole bottle. But either way, Réserve Spéciale is a great sipper and a worthwhile addition to your collection. While I've used this rhum in a cocktail before, I wanted to create something new to highlight it. The nose is warm, with spices from the falernum and bitters along with a bit of rhum. The sip begins gently, moving into berry/wine sweetness, then fading through the spectrum of bitterness from the vermouths and Angostura, while sharp notes of ginger bounce around. Throughout it all, the rhum undergirds the other flavors, showing more assertiveness on the finish. 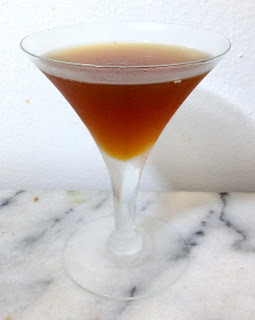 I decided to emphasize the more bitter aspects of this rhum with a Perfect Manhattan variation. The vermouths do keep it a bit on point by emphasizing the wine/brandy flavors of the rhum, while taking it in a more bitter direction with the falernum keeping it from getting out of hand. Overall a tasty drink. La Favorite is another of the small handful of distillers on the island of Martinique who are licensed to produce AOC rhum agricole. The distillery was built in 1842 and its ride through the rest of the 19th century was rather bumpy. In 1909 the distillery was bought by Henri Dormoy, whose family continues to own the distillery down to the present day. This makes La Favorite one of only two remaining family owned rhum agricole distilleries. The distillery now runs two copper single-column stills with an annual production of ~500,000 L. This makes it a bit bigger than the smallest rhum agricole distillery, Neisson, but still tiny on a global scale. Nose: strong - but mildly sweet - oak, berries, vanilla, grassy notes, nutmeg, salty bacon. Dilution makes the oak a bit fresher, with the berries and vanilla holding strong, but overall much simpler. Taste: mild creamy sweetness up front, with a large blast of pepper that continues through, grass, berries, brandy, and bitter oak going into the finish. After adding a few drops of water, the palate becomes rather flat, with only hints of its original features, mostly pared down to grassy bittersweet cane juice. As a rhum vieux, all of the spirit going into this expression has been aged for at least three years in either French limousin oak barrels or re-charred American oak ex-bourbon barrels. This rhum reminds me of Springbank/Hazelburn scotch whisky, with the mix of berries, vegetation, oak, and salted meat. After first pouring the spirit into the glass, the oak dominates in an unpleasant fashion, but after time it settles down, letting the berry notes take over. The one major flaw I can find is the low bottling proof, which doesn't help the rhum stand up to even minor amounts of dilution. The flavors could also stand to be a little bit bolder - even 43% could give it that extra nudge. That change alone would push this rhum way up the league table for me, as its unique flavor combination is very intriguing. On the upside, the lower proof does make it one of the easiest sippers neat that I've encountered in the world of aged rhums. Additionally, La Favorite Vieux is on the cheaper end of the spectrum at $50 for a liter bottle, which puts it well below comparable offerings from Clément, Saint James, Rhum J.M., or Neisson. Combine all ingredients, stir with ice for 15 seconds, then strain into a chilled cocktail glass. The nose is herbaceous oak with bittersweet cherry and a hint of anise. The sip begins silky smooth, moving through off-dry cherry, to grassy herbs, then dark chocolate and bitter oak tinged with anise. With time as the drink warms up, the smells and flavors become a single chord rather than separate notes. This is an interesting cocktail. While I set out to buttress the inherent flavors of rhum agricole, this the Chartreuse/Heering combo is almost indistinguishable from the rhum, despite having rather strong flavors of their own. So it's a very 'on point' drink, with the ingredients reinforcing each other, rather than playing counterpoint. This drink comes from the Savoy Cocktail Book circa 1930, by way of Vintage Spirits & Forgotten Cocktails. 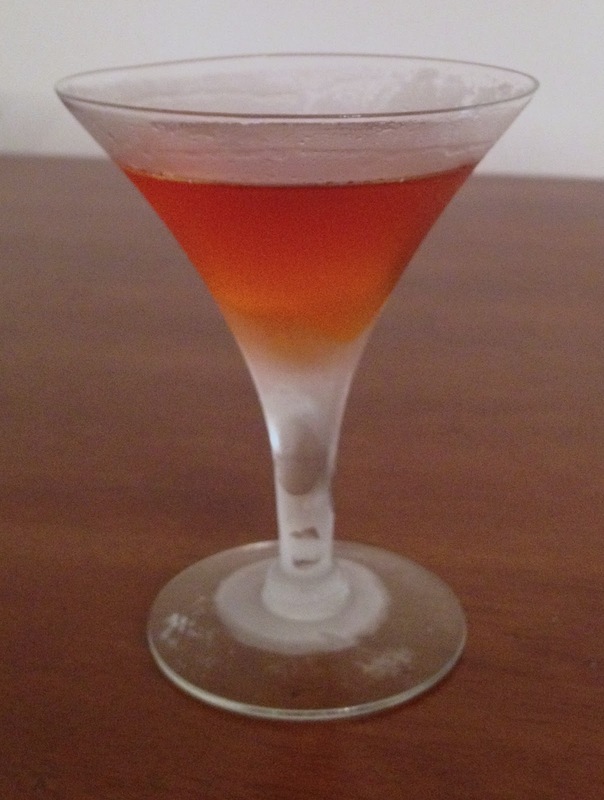 There are two versions of the drink - straight, when made with Grand Marnier, and curled, when made with curaçao. Either way, it will be delicious. The nose is relatively muted, revealing flashes of orange bitters, grape from the wines, and a hint of baking spices. The sip opens with orange sweetness, which carries through almost to the back. 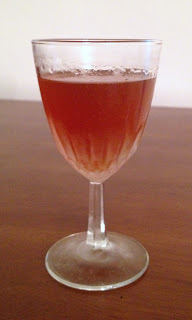 It is joined by various bitter notes, from the vermouths, gin, and bitters, which form a harmonious whole. The finish is pleasant and not overwhelmingly bitter, rather making the drink more-ish. Oh man, I am shocked by just how good this drink is. On paper, it looks like a huge bitter fest, but the orange juice and liqueur conspire to keep everything in balance. So much so that it feels almost tropical. I would actually be really happy sipping this drink of a warm, sandy beach. The fruit just meshes so well with the bitter components. The drink actually improves a bit as it warms up, with the nose becoming more expansive and the palate gaining a bit more definition. Overall, I'll call this one a winner. Last up in my series reviewing Mount Gay rums - their nearly top-of-the-line Extra Old (XO) expression. While I've reviewed Mt. Gay XO before, I was interested in revisiting it to see if my perceptions had changed over the last few years. Mount Gay ferments their molasses mash for a fairly long 72 hours, to give an ABV between 6-7%. As noted, they distill in both pot and column stills, the output of which is barreled and aged separately. Mount Gay refills their ex-Jim Beam bourbon barrels three times before discarding them. XO in the United States doesn't have an age statement, but as best I can figure out is put together from a blend of rums aged from 8-17 years with an average around 10 years old, which is then diluted and bottled at 43% ABV. 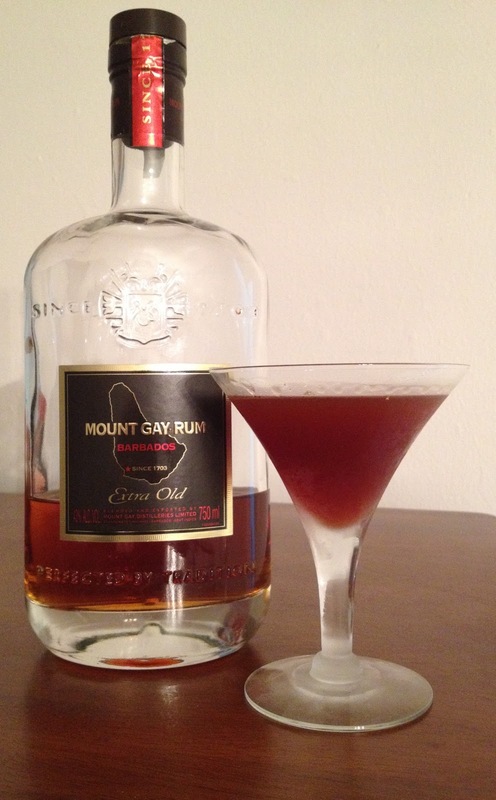 A minus is that Mount Gay chill filters all of their rums. While this is somewhat understandable given the lower bottling proof, as a 'premium' product, I'd really like to see them follow the trend in scotch whisky for higher bottling proofs and no chill filtration. That would help them stand out from the pack more than the fancy new bottles. Nose: smooth, mild molasses and maple syrup, ripe tropical fruits, a hint of cherry/raspberry/blackberry, gently woody oak, a bit of vanilla. After dilution it becomes mellower and lighter, with the sweetness shifting towards brown sugar and the fruit retaining its heft. Taste: opens with strong sugary sweetness and black pepper, becomes buttery molasses and oak, with the pepper diminishing into bitter oak and residual sugar. After dilution, syrupy sweetness dominates, with the other flavors becoming accents rather than coming in distinct phases, with emerging fruit and still strong pepper. While Mt. Gay XO bumps up the standard bottling proof from their lower-tier rum to 43%, you'd be hard pressed to notice the extra alcohol while drinking it. This is an incredibly smooth sipping rum, with the buttery diacetyl element helping to smooth everything out. I was pretty close the first time I reviewed this rum, catching most of the major features - molasses, butter and black pepper. Time and experience have revealed some nice fruit and vanilla notes and let me experience the structure of the experience more finely, but the overall structure is still there. Admittedly, the rum may have lost something in being open for two years, but there's definitely nothing off about it. As I noted in my original post, MGXO also makes a wickedly good cocktail. This time I decided to go a different route, with a more savory drink instead of the standard daiquiri. The savory, almost salty, notes of sherry rise off of the drink, mingling with sweet oak from the rum and cherry spice notes from the bitters. The sip begins thinly, slowly building up oak from the rum, almond from the orgeat, and baking spices from the bitters, then a grape note from the sherry combining with molasses from the rum and cherry from the Angostura, and finishing with cleansing bittersweetness and a bit of pepper. 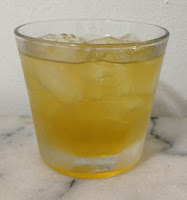 This cocktail is a modification of the classic Japanese cocktail. I'm actually pretty impressed with how well the rum held up. 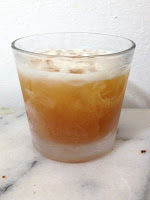 Sherry, orgeat, and Angostura bitters are all pretty potent ingredients, but the rum wove its way through the whole drink. The other elements modified rather than obliterated the rum's flavors. Overall I think Mt. Gay has a really good set of rums. Eclipse is a rather good value and a solid starting point if you're just getting into rum. If you can find it, Sugar Cane rum is a quirky rum that won't set you back to much money. And XO is decadent, though flirting with being over-oaked. I do wish they had stuck with their old bottles, which were much more distinctive, rather than the squarish new ones that scream marketing department. However, as long as what's inside is good, I won't worry too much about the packaging. Next up in the series of Mount Gay rum reviews - their former mid-range Sugar Cane rum. Despite the name, this is a rum made from molasses, rather than cane juice like a rhum agricole. That it still manages to taste like a cane juice rum has to be chalked up to the skills of Mount Gay's Master Blender, Jerry Edwards. He is another chemist-turned master blender along with Joy Spence of Appleton and Billy Walker of BenRiach - maybe there'll be another career in my future yet. But to come back around, this is quite an accomplishment as Mount Gay exclusively uses ex-bourbon barrels from Jim Beam, which means that this variety in flavors is purely the result of distillation, aging, and blending. It still amazes me that this rum manages to contain distinctly agricole-style flavors of grass and cane juice. With that said, it is manages to effectively straddle the two worlds, retaining the molasses and strong vanilla of the other side. The rum is bottled at a standard 40%, helping to make it a rather mellow sipper. Sadly, this fantastic mid-range rum has been discontinued, as Mt. Gay has consolidated their product line. Hopefully they will bring it back, as it fills in the space between the aged version of Eclipse and Extra Old. If I had my druthers, they would bring it back with a higher bottling proof to more directly compete with agricoles (which are regularly bottled between 45% and 50%), but that's just wishful thinking. For now I'll have to enjoy what's left of my bottle. The nose is sweet molasses inflected with orange creamsicle, grapefruit, and subtle herbs. The sip begins with mounting orange sweetness, which is joined by herbal notes from the Bénédictine, rum, and spices from the Angostura. The finish leads with sharp grapefruit notes, which recede to vanilla sweetness. This drink is a bit of a wild ride. It begins sweetly, swaps to herbal and spicy bitterness, jumps to a burst of bitter grapefruit, then goes out sweetly again. As a note, the flavors will become a bit more integrated if you let the drink warm up. I wanted to make something that would emphasize the grassy character of the rum while bringing in a bit of fruit. 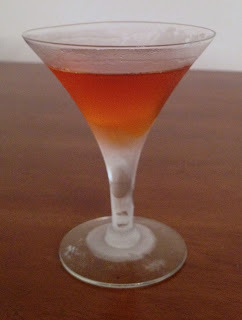 The Bénédictine worked well and didn't overwhelm the drink, letting the rum shine as well. Tomorrow we'll finish off with the second oldest rum Mount Gay offers, their Extra Old expression.